Nearing year’s end, here are a couple notes from headquarters. Creek Road Runners co-founder CRR Bob Bennett turned 75 on Sunday, Dec. 18. Several old friends (all Creek Road Runners themselves) gathered at a celebratory lunch for him this week. Though he isn’t getting out to run on Creek Road much anymore, he does take advantage of the James F. Hall Trail and an occasional hike with the Wilmington Trail Club. 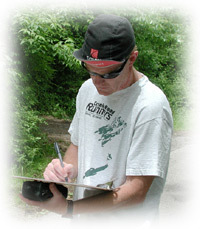 Pictured here is Bennett at the Arc Corner Monument in White Clay Creek State Park on a recent walk with CRR Mark Deshon. CRR Mark Deshon was getting ready for a workout recently, having just parked at the foot of Wedgewood Road. He had just stepped out of his car when, coming toward him on Creek Road, he spotted CRR David James. James (pictured, right), who still holds state records in the 10K and 10-mile distances for the 55-59 age group, had been off the racing circuit for the past several years, having suffered from severe bouts of vertigo, but is back out on Creek Road again. Deshon ran with him for a while that day, catching up with an old friend and one-time racing nemesis. The annual Creek Road Runners “Wring Out the Old, Ring in the New” trail run will take place on Dec. 31. 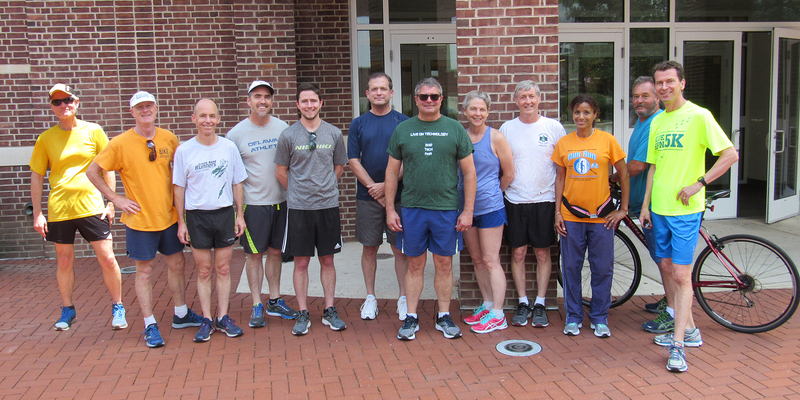 As another academic year comes to a close, the University of Delaware’s annual Alumni Weekend is on the horizon, and with it its feature Blue Hen 5K race on Sunday morning, June 5. But you don’t have to be a Blue Hen alum to run this basic out-and-back race, which starts on UD’s Laird (north) Campus and takes in a lot of Creek Road along the way. Join YoUDee (the University’s mascot) and others for this fun 5K. See full story. Register now. “Dorothy Miller passed away at her home [yesterday] morning. She was one of the leaders of the initiative to establish an Advisory Council for White Clay Creek State Park and one of the initial representatives to the Council. “As many of you [may] know, Dorothy was a major force for the preservation of open space throughout Delaware and, in particular, in the White Clay Creek area. Initially, she was a key leader in the effort to prevent the damming of White Clay Creek, which ultimately led to a major donation of lands acquired by the DuPont Company for the planned reservoir. These lands became the core of Delaware’s White Clay Creek State Park and Pennsylvania’s White Clay Creek Preserve. Subsequently she continued as a leader in efforts that preserved many hundreds of additional acres for the Park. She also was one of the main leaders of the campaign that resulted in the designation of the entire White Clay Creek watershed as a National Wild & Scenic River.